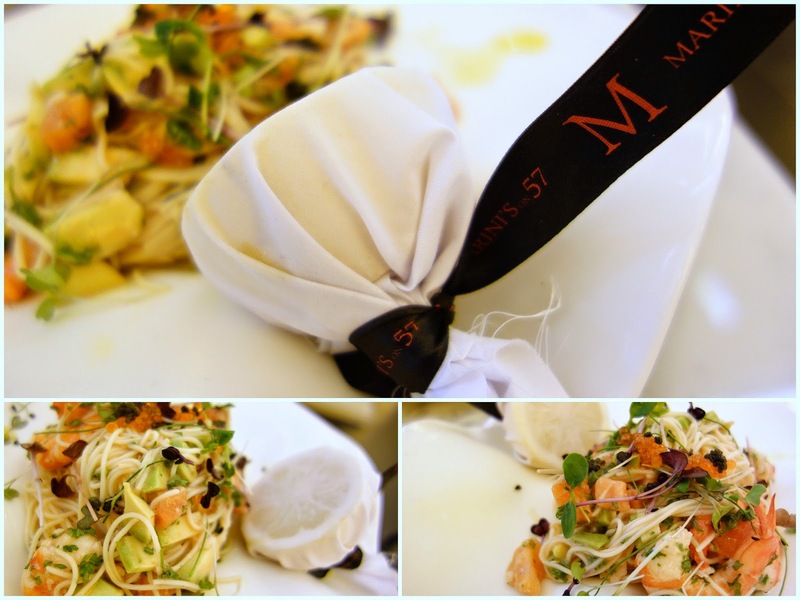 Cold pasta, chilled seafood & cool cocktails constitute the hottest attractions at Suria KLCC's M Marini Caffe, one of two new venues unveiled this past month by the people behind Marini's On 57. 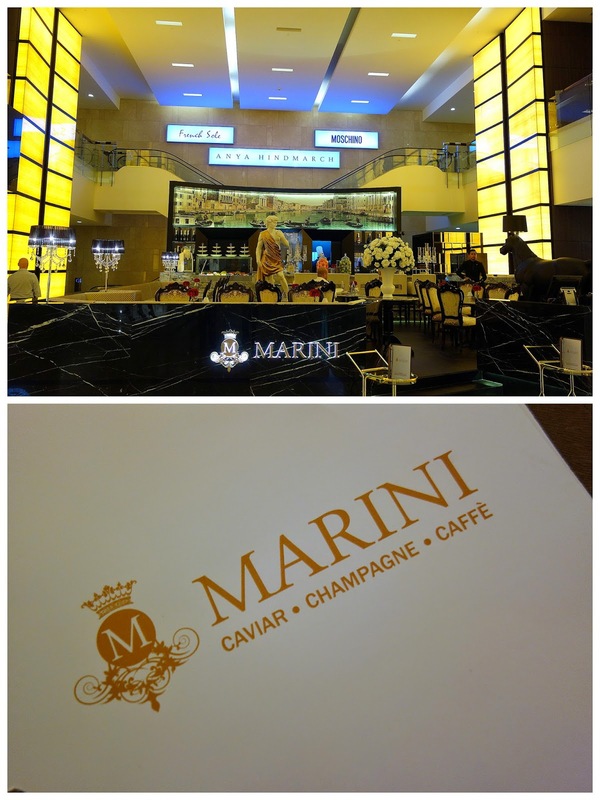 For a look at Marini's other fresh offspring, the beef-loving Marble 8 Steakhouse & Bar at Binjai, click here. M Marini Caffe takes up space amid big-ticket businesses like Versace, Cartier & Georgio Armani, so it might cater best to shoppers at those stores; the first page on the menu here features a selection of caviar, ranging from the roe of Petulama ocean trout & pike to top-flight Sevruga, Ossetra & Beluga that'll cost as much as plane tickets. 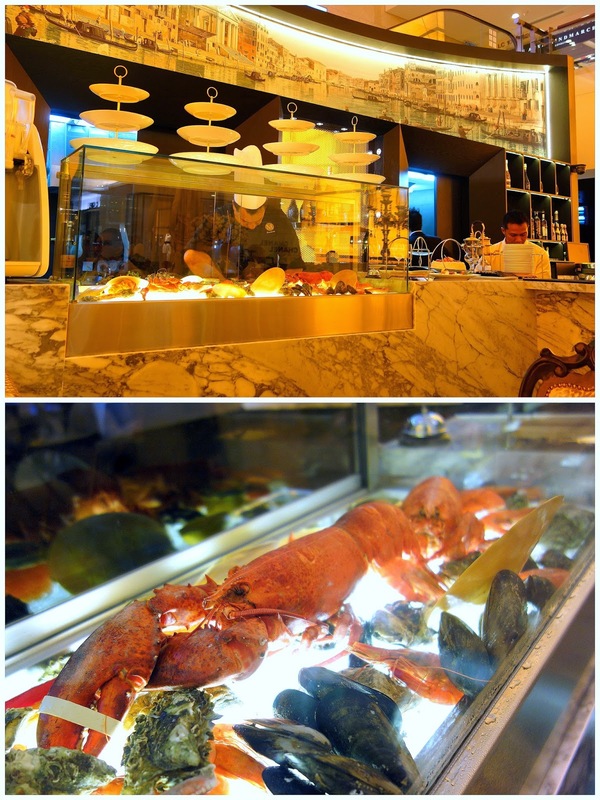 A crustacean bar occupies a place of pride here, with lobster & shrimp taking centre stage. Crudos are available, spanning raw servings of fresh Hokkaido scallops, tuna & more. A variety of cold pasta comes recommended; this one features delicate strands of capellini mixed with 'ama ebi' spot prawns, salmon, avocado, yellow tomatoes & salmon roe (RM42). 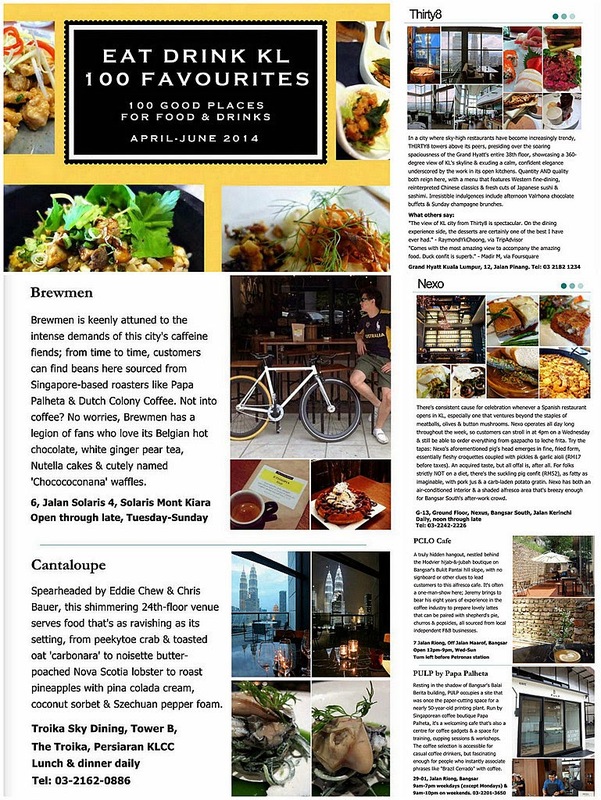 Other pasta options can be crowned with the likes of momotaro tomatoes & burrata cheese; patrons willing to splurge can order a RM228 pasta with Sevruga caviar, oysters, truffle oil, chives & creme fraiche. Irish native oysters come at RM8 per piece, a worthwhile choice, served with raspberry shallot vinaigrette & horseradish cocktail sauce. The pricier oysters include French Fine de Claire & Belon ones. Salads prove more affordable: The signature recipe comprises roasted free-range chicken, poached organic eggs, sliced apples & 23 types of veggies from Australia, tossed in a kitchen-made sweet dressing (RM28). The main-course list is compact; keeping in line with the healthy theme, this sous-vide Petaluma ocean trout with crisp fennel salad & trout eggs (RM68) probably works well as low-guilt nutrition. Here's what we found pretty memorable: Espresso & soy milk combined with Bailey's & truffle oil (!). It succeeds; the earthiness of the oil supplies a discernible aroma that complements the rest of this lightly sweet coffee cocktail. 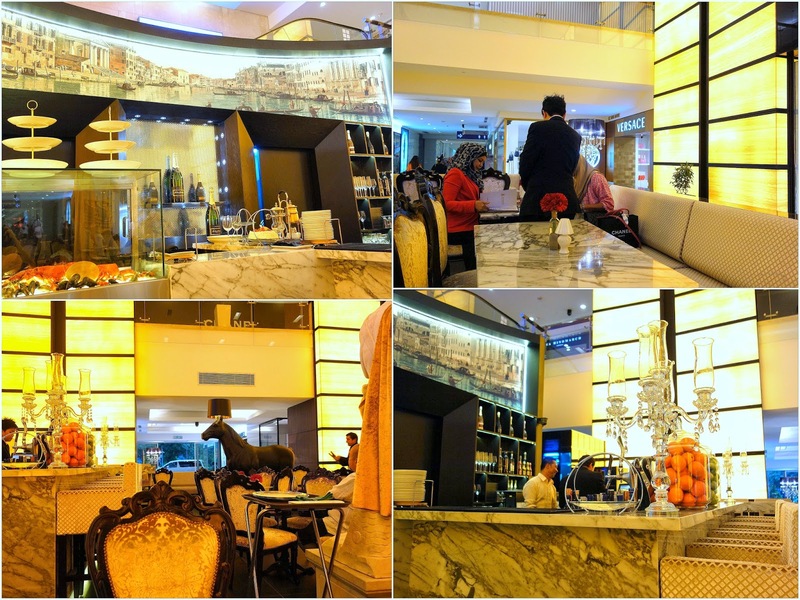 All in all, M Marini Caffe is an interesting addition to Suria KLCC, with a menu that's tantalising to browse, though this ultimately is the type of establishment where the water is sold as still or sparkling, nothing less. I'd visit the place for the oysters! 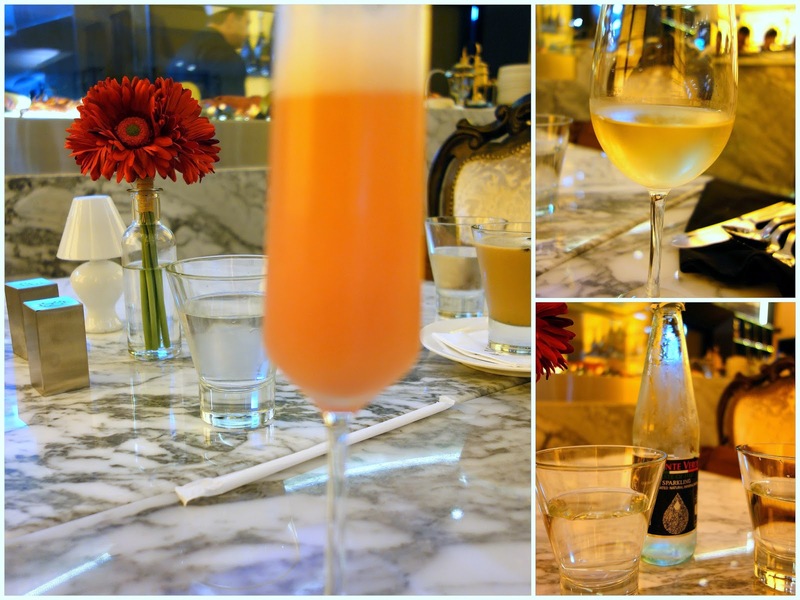 I love the decor and ambiance, the marble counter and the drinks look really good. I have to be honest, though, I am not big on pasta...hot or cold! I've been wondering since your mention in your last write up what the new place would be. Now I know. Similar price tags. Hmmm. Oop that looks pretty exclusive...decor is a little, exuberant..?